"Every few years we get a new exotic insect or disease that comes in and is able to do a number on our native forests," says Kevin Potter, a North Carolina State University research associate professor in the Department of Forestry and Environmental Sciences and co-author of an article about the research in Proceedings of the National Academy of Sciences. "Emerald ash borer is clobbering a number of ash species in the Midwest and increasingly in the South. The chestnut, a magnificent tree that had immense ecosystem value as well as economic value in the South and North, is pretty much gone because of a pathogen. And hemlocks are under attack by the hemlock woolly adelgid from the Northeast along the Appalachian Mountains into the South." To better understand how nonnative insects and diseases invade U.S. forests, researchers tested conflicting ideas about biodiversity. The first is that having more tree species can facilitate the diversity of pests by providing more places for them to gain a toehold. Another possibility is that tree biodiversity can have protective effects for forests, such as by diluting the pool of host trees and making it harder for pests to become established. "We found that both facilitation and dilution seem to be happening at the same time," Potter says. "What we found is that native tree biodiversity really is important, but it's important in different ways at different times." Combining two national county-level data sets, researchers found that relationships between tree diversity and pest diversity follow a hump-shaped curve. "As you have an increasing number of tree species, you have an increasing number of pest species, up to an inflection point where that relationship changes," Potter says. "Then you have a decreasing number of pest species as the number of host tree species increases." Overall, counties where forests have 30 to 40 different host tree species tend to have the most nonnative pests. But the effects depend on whether the invader is a specialist that can infest only a single tree species or whether it's a generalist, like the gypsy moth, which can spread to more than 60 different hosts. 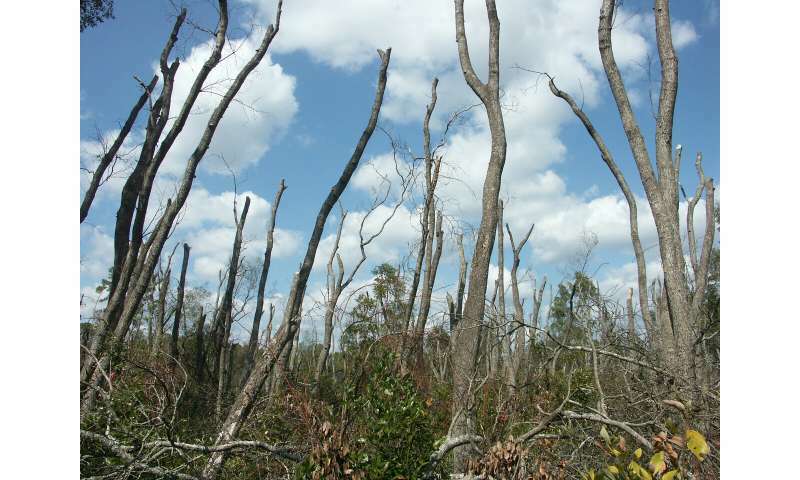 "What we see is that forests in the Midwest and up into New England are at the middle part of that hump-shaped curve in terms of the number of host tree species, and those are places where there have been a lot of insect and disease problems," Potter says. "Out West we have fewer insect and disease pests, but in some cases they still do a lot of damage because the forests are not diverse. If you have a specialist pest come in and knock back one of the major components of your biodiversity, then that can have a greater impact. An example of how that works would be Sudden Oak Death, a disease in California that's affecting oaks there." 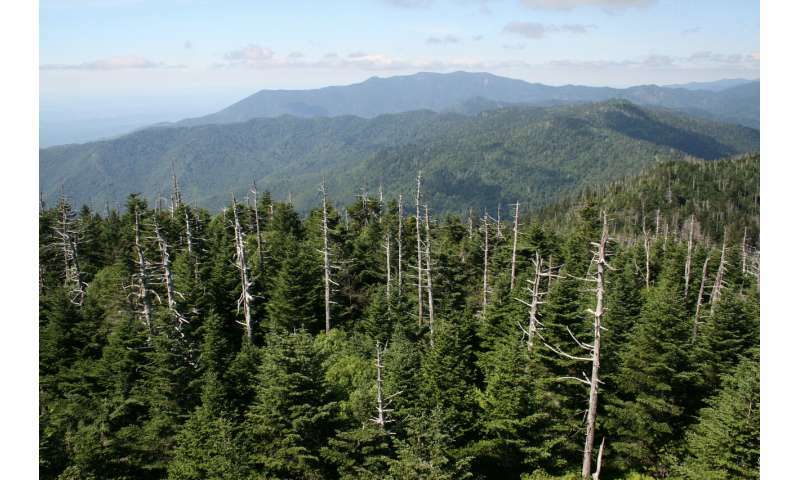 Researchers with the U.S. Forest Service, Purdue, NC State, Czech University of Life Sciences and Duke collaborated on the study, which used two large datasets. The U.S. Forest Inventory and Analysis, a national forest census, contains information from 135,000 forested plots across the U.S. where crews regularly measure trees and check environmental conditions. For this study, the FIA data were used to compile counts of tree species for each of 2,098 counties. The Alien Forest Pest Explorer database offers a county-level record of the presence or absence of nonnative insects and diseases, including 66 used for this study. Researchers also examined other factors that could affect pest invasions, such as human population density and environmental conditions, including precipitation, elevation and average temperature. Tree biodiversity was a better predictor of nonnative pests, Potter says. Results could help prioritize monitoring efforts for forests most at risk for future pest invasions, he says. "The unfortunate reality is that a lot of times we don't notice these exotic pests and diseases until they've gotten established and start having an impact on our native species, when it's almost too late."